I saw it with my own two ties! If it seems like I’ve begun my last two or three posts with some major whining about being behind on my tie posts, it’s probably true. But, I’m done complaining, and will just get to it. I will post all of the ties, but not in the order in which they were worn. We’ll just post the last one I wore, and go backward in time from there. 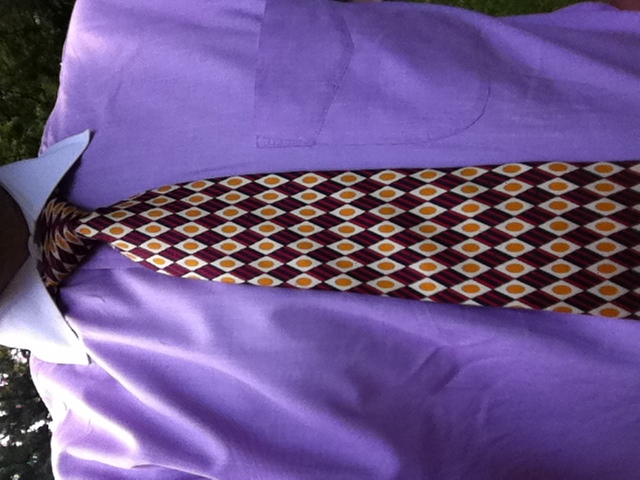 And, if I wear another tie, I’ll post that one as I wear it. If it seems like I’ve made these kind of promises in the last two or three posts, it’s definitely true. No more promises, I’ll do what I can. Hmmm…now what do I say? I had some sales calls to make downtown with Few Spirits, so I got gussied up in Tie du Jour numéro un, this geometrically-unchallenged strip from Burberry. After meeting with the beverage director at Mastro’s Steakhouse, I went for a little walk, stopping in at several places, ending up at the grand opening of Cantina Laredo, version Chicago. Delicious mini-fish tacos…or were they fish mini-tacos? Fish taco minis? Either way…yum. Then, I got home and wanted to be a bit fresher for the 2nd Annual Evanston Business Mash-Up, which is run by my former employer, the Evanston Chamber of Commerce. It was such a nice night (like last year’s event), right on the beach at Northwestern (like last year), and I was able to go home straight after (unlike last year). Paul and I sampled some Few for the masses. 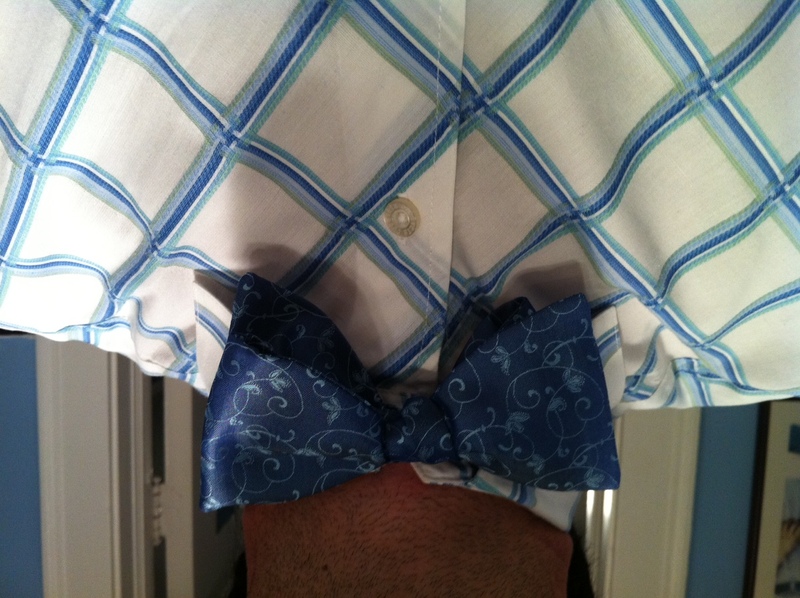 Part of my fresher ensemble was cedntered around TdJ#2, my bow tie from Paul Fredrick, picked up on their website recently. This is that cornflower blue that I love, and the fabric is just top-quality. This and my diamond-patterned shirt went nicely with my new Astor & Black suit. I’ll have to make an ensemble photo with that soon. Although there were many ties at the Mash Up, I only took one picture, as I was more in Few Spirits mode. But, since this FSFAWT (Former Senator, Former Ambassador With Tie) was wearing a scarf around her neck, I figured that was enough of a tie to make it into 100D100T. 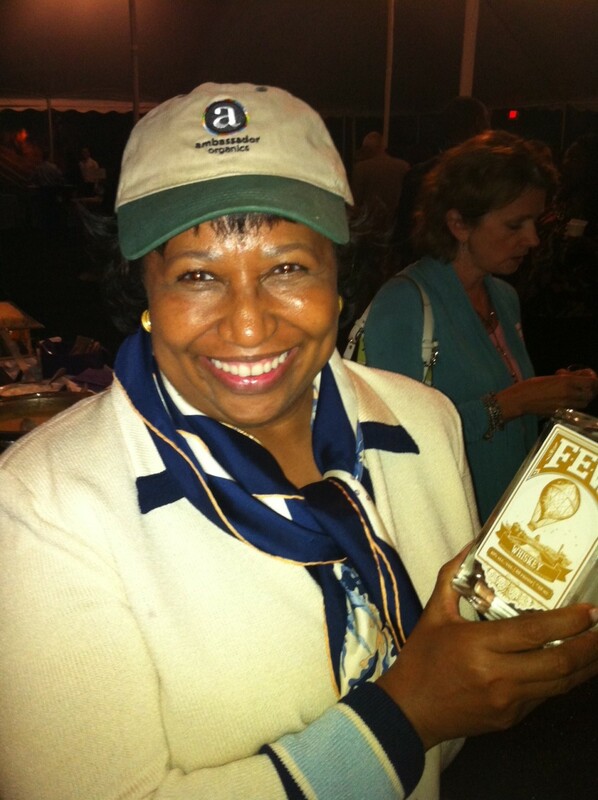 Say hello to Senator Carol Moseley Braun, holding her very own bottle of Few White Whiskey. At the risk of being simply satisfied that I have actually completed a posting, I’ll rest my case here.